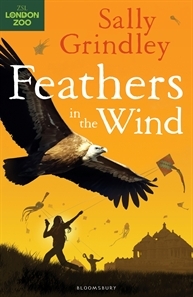 When the Brook family travel to India for the annual kite festival in Ahmedabad, Joe can't wait to buy his own kite at the night-time bazaar and get involved with the locals' celebrations. However, the festivities have a little-known darker side - the strings of fighter kites are glazed with shards of glass (so that they can cut down other kites) and these kite strings injure many birds as they become entangled in them. Joe's mother will be working day and night at a rescue centre as she aims to save every single injured bird, particularly the endangered vultures. Can Joe and Aesha pull off a daring rescue attempt of their own on the day of the festival? This is the third book in the International Rescue series, and the second one I have read. This time Joe and his sister Aesha are off to India, where his Mum, Binti, will be working with the local Animal Aid Service. There area lot of animal facts to be found throughout the story about vultures, their habitat and threats, in the rescue centre there are also owls, monkeys, fruit bats and there’s even a cobra. As well as being about the animals, or birds in this case, the book also reads a bit like a travel journal. Joe describes what it is like to be in a new country, he talks about the surroundings, the food, the people and a day of tourist activities gives us an idea of what the town of Ahmedabad has to offer. One of the highlights of the family’s trip is a visit to Science City, which has exhibits, rides and an amazing musical water fountain, that Joe is sure won’t be that impressive, but he is amazed. The other thing I like about this series is the relationship between Joe and Aesha, it captures the younger brother older sister thing perfectly. Joe is young enough to still be excited about everything he sees, while Aesha, a teenager, thinks she is too cool for most things. You can see though, that Aesha struggles with the indifference at times, and her enthusiasm can’t help but bubble over, it’s these moments Joe relishes, when his sister is excited about things and she wants to do things with him, in this case learn to fly a kite. This series has a good mix, information for animal lovers, cultural insight for the armchair traveller, and a good dose of drama and suspense, when Joe and his sister find themselves lost and cornered by rabid dogs when they attempt to save an injured vulture. ZSL (Zoological Society of London) are supporters of this publication, and I have included a link below, so that you can see what the ZSL are doing for many endangered animals, including the vultures talked about in this book.